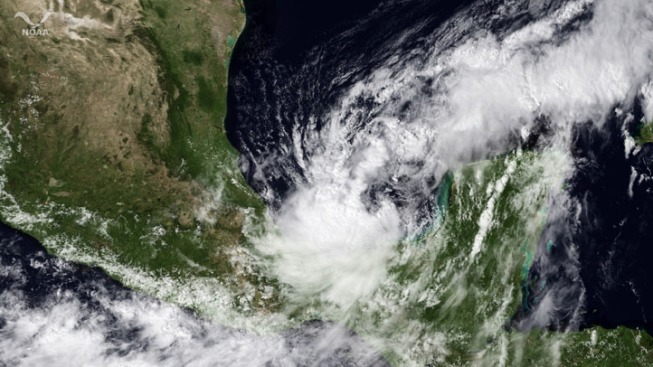 In this satellite handout from National Oceanic and Atmospheric Administration (NOAA), Tropical Storm Nate passes near the Yucatan Peninsula September 8, 2011 as seen from space. Nate has formed in the Gulf of Mexico prompting tropical storm warnings for parts of the Mexican coast. Weather forecasters say Tropical Storm Nate is growing stronger and could be near hurricane strength when it hits Mexico on Sunday. That means zero hope the storm system will bring rain to drought-stricken North Texas. The National Weather Service said at 1 p.m. Saturday that Nate was centered 145 miles (233 kilometers) east-northeast of Veracruz, with maximum sustained winds near 60 mph (97 kph). It was inching westward. Meanwhile, Katia has been downgraded in the far north Atlantic, and the remnants of Maria are barely a tropical cyclone. The National Hurricane Center says Katia is still expected to bring strong winds to the British Isles on Monday. The storm was centered about 295 miles (475 kilometers) east-southeast of Cape Race, Newfoundland. Forecasters said Maria was about 310 miles (499 kilometers) east-southeast of San Juan, Puerto Rico, with winds reaching 40 mph (64 kph).